Today, I have a fun little free printable for the little ones. A Monster Memory Match game printable. We all played memory at one time or another, You know the card game that you lay the cards out face down and pick the matches. Well, I thought it would be fun for the kids to have a little fun spooky Halloween themed set for themselves. Not only do memory games help them with their memory but helps them with their concentration. 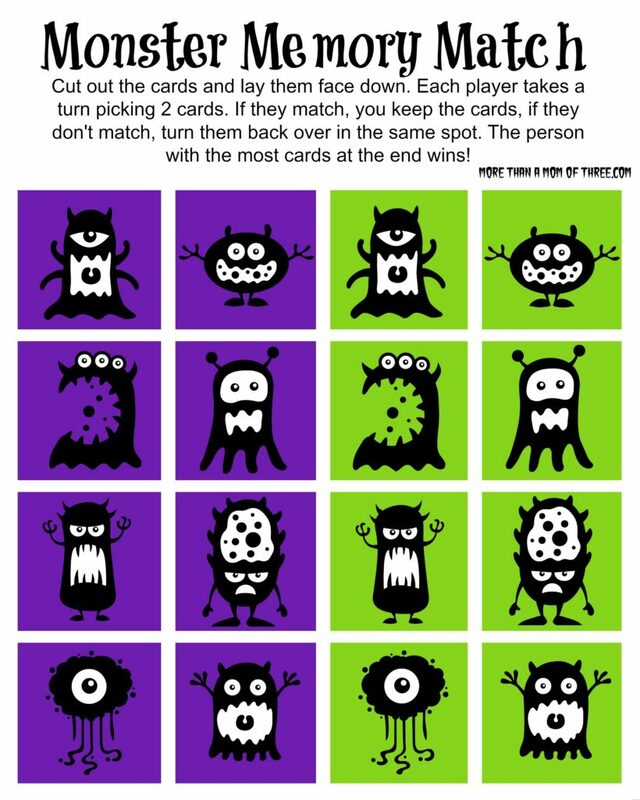 This Monster Memory Match game is perfect for toddlers and preschoolers since it only has a few pieces to match. My three-year-old is having so much fun with it. He loves me to watch him get the right ones matched together. Download a copy of the Halloween Monster Memory Match Game Printable and while you are printing don’t forget to print them the two free Halloween coloring pages I have on the blog. Thank you for your interest in these printables! Click the actual image or the link noted to open it as a PDF. From there you can download and print free of charge. When saving these printables you are agreeing to the terms below. You may not use these to copy or sell to make a profit. You can not alter any free printable that you download from this site. Do not modify and pass off as your own. I love when other readers share my free printables. Feel free to use (1) one image per post and it must contain a link back to my original post. You can resize the image to fit your needs. I’d love to be tagged in any social media post when using my printables in any way. This is a great little matching game. I love these little ghoulish monsters! Thanks for the printable. What a fun little game this sounds like. I am sure all the little ones out there will love it–along with the coloring pages. I enjoy a good memory game even if I’m bad at it. This looks like a good time. I’m sure my kids would have fun. Kristen from The Road to Domestication recently posted…Home Matters Link Up Party #8! When I was a kid, I loved playing those memory games! I still like some of them too! This is such a fun idea for a Halloween game, thanks for sharing! What a fun matching game!! I need to try this! I love this! I just started playing memory with my daughter- so this is the perfect game for the season AND her learning! My girls always loved playing memory games with me. Probably because they always won lol. This is a super cute one, and very festive for the season! This is an awesome game and I love playing memory games with the kids. It makes them think. Thanks for sharing. Nice seasonal game that you don’t have to worry about it getting lost or destroyed! These are adorable. My kids would have so much fun making matches. Super cute. My kids love playing Memory and this Halloween themed one is so fun! This is so stinking cute! My kids would just love it Thank you! I love memory. I am going to have to show this to kiddo and see if she wants to play! Pinned! such a cute idea. my girls would love playing this. Oh how fun! My son will get a kick out of this, thank you for sharing! Shell Feis recently posted…Welcome Fall by Winning the Essentials! Thanks I printed it out for my kids! followed you from Round Tuit linky!